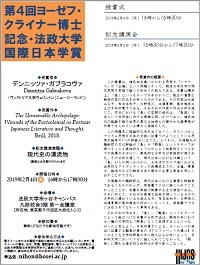 Hosei University Research Center for International Japanese Studies will hold the Award Ceremony and the Lecture for the 4th Professor Josef Kreiner Hosei University Award for International Japanese Studies at Hosei University. *The official language of the speech is Japanese. Dr Gabrakova’s speech is based on her book The Unnamable Archipelago: Wounds of the Postcolonial in Postwar Japanese Literature and Thought (Brill, May 2018), the award winning book for the 4th Kreiner Award, and examines a meaning of concept postcolonial in postwar Japanese literature and thought.